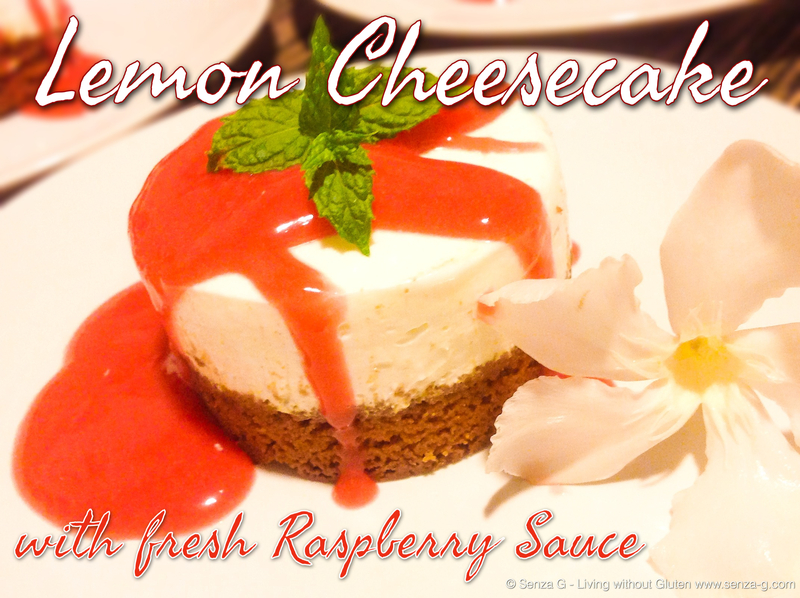 There is nothing more refreshing than this cool and tangy Lemon Cheesecake on a hot summer evening! Quite a relatively easy, no-bake recipe which needs to be prepared ahead of serving time since it has to set in the fridge, preferably overnight. For the biscuit base, you can use any plain gluten free biscuits. I used Hoops biscuits of Dr Schar, which you can easily find in supermarkets everywhere. To make it a bit more interesting, I added some ginger to the base. The quantities below makes 4 mini cheesecakes. Put the biscuits in a food processor and blitz into crumbs. Add the ginger powder and pulse again until combined. Tip the crumbs into a bowl, add the melted butter and mix well. Oil 4 ring molds and place on a baking sheet lined with baking paper. Divide the crumb mixture and press down firmly. Chill whilst making the filling. Beat the cream cheese until soft and creamy, then add the sugar, lemon juice & zest and keep beating until smooth. Whip the cream in a separate bowl until soft peaks form. Fold the whipped cream into the cream cheese mixture. Carefully spoon onto the biscuit crumb bases in the molds. Leave to set in the fridge overnight. Put the raspberries, sugar and lemon in a liquidizer and blend to a puree. Sieve this over a bowl, pressing down, so you remove the pips. Add more sugar if required. To serve, gently push out the mini cheesecakes from the mold onto a plate. Drizzle with the raspberry coulis and garnish with extra raspberries and a mint sprig on top. I myself forgot to garnish with raspberries! I realised after taking the picture ! It was still enjoyed! Plates were wiped clean! That is a good sign, no?